Laminated projection screens - our DAP Optima projection screens - are the newest generation of DAP products from Macada Innovision. We carry out the entire lamination process and installation ourselves, the only company in the Netherlands to do so. The DAP OPTIMA projection screens have been developed for situations with high ambient light levels, where use is also made of projectors with short focal lengths. The screen is highly suited to the projection of data, for example PowerPoint or Excel presentations, and video projection. 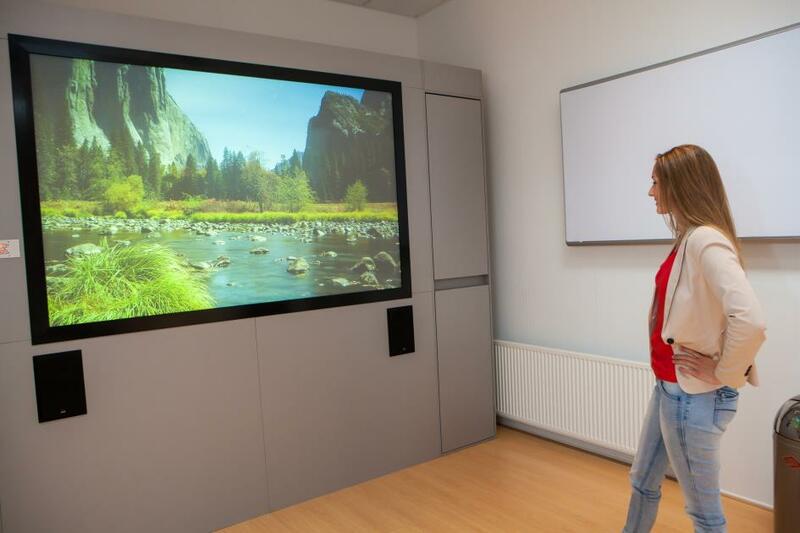 All DAP OPTIMA projection screens can be made interactive if so desired. The high-quality optical coating provides a very broad viewing angle, and at the same time prevents the well-known ‘blind spot’ caused by the projector (hotspot). The screen delivers bright images, excellent contrast, high colour saturation and high resolution. In the case of larger DAPOPTIMA projection screens, multiple projectors are often used to project tiled, or partially overlapping, images. The visible border between two images is filtered out using soft edge blending software. The substrate is either glass or acrylic, to which a high-quality projection coating is added. The coating gives the screen the desired material properties. Het The actual production of a laminated screen is an extremely precise process, requiring skill and experience. It involves both customised manufacturing and craftsmanship. The complete lamination of a projection screen takes two weeks on average. Macada Innovision levert verschillende typen DAP OPTIMA projectieschermen, voor doorzicht- opzicht- en 3D-beeldprojectie. Omdat we de schermen zelf vervaardigen is 100% maatwerk mogelijk. All sizes of screens can be produced, from small to very large. Welding seams are sometimes necessary, depending on the width of the projection material to be laminated, but these are almost always invisible under projection. * Front screen projection via a fixed screen, is that possible? receive a call from us? and sign up for our newsletter.